Take exit 65 off the AP7 Highway (Benidorm Levante). Go down the Avda. de Europa until you reach Avda. Mediterráneo, turn left and follow the Avda. Mediterráneo until the end. At the statue, turn left down the Avda. L’Atmetlla de Mar and then go straight on the Avda. Doctor Severo Ochoa. The Flamingo Oasis is placed in your left. Leaving the airport follow the signs for Valencia. After 20 minutes the road divides and you have the option to follow the motorway or the national road. The A7 motorway is a toll road and costs 3 – 4€ to use, take the exit for Benidorm Playa Levante. Using the national road the Nº 332 take the second exit for Benidorm. Our guest rooms are distributed throughout the 25 floors of the hotel. They consist of 2 single beds and two sofa-beds (or two armchairs). They are all equipped with the following amenities to guarantee maximum comfort during your stay: large balconies with views of the pool or mountain, a complete bathroom, telephone, air conditioning, television, satellite television channels, hair dryer and the possibility of an optional safe. Free wifi. With 29 m2 of space and montain view, the family room is equipped with a double bed, a single bed and two sofa-beds. It consists of a large balcony, a complete bathroom, telephone, air conditioning, television, satellite television channels, hair dryer and the possibility of an optional safe. There is also a possibility of including a cot in the room. 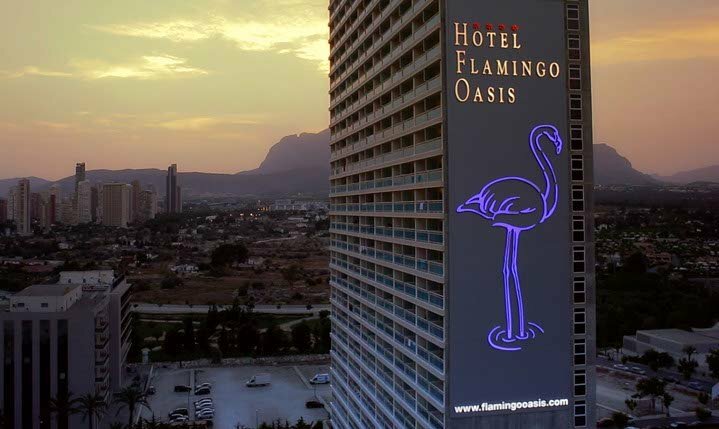 The popular Hotel Flamingo Oasis offers our guests fun in the sun All Inclusive holidays, with comfortable rooms, great food and entertainment for everyone. Spacious, bright, light rooms offer comfortable accommodation for up to four people, with two single beds and two sofa beds, fully equipped bathrooms with hairdryers, and balconies with views of the Benidorm skyline. Our All Inclusive service includes snacks and a buffet restaurant with national and international dishes and themed nights to enhance your dining experience. There’s a Piano bar where the adults can chill out in the evenings, a large lobby bar, and the show bar where you can enjoy the nightly shows performed by our in-house entertainments team. Relax by the large outdoor pool, soak up the sun, join in the pool activities or enjoy a snack at the pool bar during the summer – it’s your choice! During the winter season you can enjoy the indoor pool, and throughout the year there’s a gym, games room, sauna and massages available. During the summer season, whether you want to soak up the sun or take a refreshing dip, our large pool is the place to be. There are sun loungers for relaxing, the Bar Laguna where you can enjoy a drink or a snack as well as activities during the day, and during the summer you can enjoy the performances and shows performed by our in-house entertainments team. What more can you ask for? *"This pool may close for maintenance work during the winter months". Relax and let us take care of you. Treat yourself to a sauna and why not a special treatment – a massage or body wrap – you’re on holiday pamper yourself in our Spa. There’s always lots going on at this hotel, daytime and evening entertainment, playground and Medkids activities during summer season. All the ingredients you need to make your holiday one to remember! Our entertainment team organizes activities such as bowls, archery, rifle shooting, mini golf, ping pong, multisport courts, football, basketball. We also invite you to our "Photocall" and watch movies every afternoon. Various types of evening entertainment , from 8:30pm until 12:00am with live performances, comedians, musical tributes like Abba, Queen available in the main bar. Our glam pianist brightens up the atmosphere every evening in the piano bar from 9 pm until 12 pm. MedKids Entertainment Programme High Season; outdoor and indoor activities for children from 4 to 12 years old. Visit our multisport zone and the gymnasium to keep up that fitness regime whilst you are on holiday. Our dining room has a buffet-style service. You will find a wide variety of Mediterranean and continental dishes to choose from. At your disposal we offer vegetarian menu and buffet for children in summer season. For special requests (intolerances, allergies), please contact the restaurant staff. • Cot can be provided. • A few minutes from the Levante Beach. International food with a buffet giving a great variety of cold and hot dishes. Special desserts buffet. A bar for the whole family in the main lobby of the hotel. Snack bar next to the hotel's main swimming pool that serves all types of hot and cold snacks. Charming bar next to the reception hall with live music.